Admiral Benbow Folk Club: A popular and friendly club in Chapel Street in the heart of Penzance. Round the room singarounds and occasional guests. Every alternate Wednesday, 8.30pm. Check the website to find out dates. Bath Inn Folk Club: A friendly club, catering for pretty much all tastes in music. Round the room singarounds and occasional 'theme' nights. Free sandwiches also make an appearance at some point in the proceedings! Alternate Wednesdays, 8.30pm. Check the website to find out dates. Home-made Music Show: A show with a difference! A monthly musical evening featuring invited performers and guests. Folk-oriented but catering for a whole range of musical tastes. First Friday of each month in the Wrecker's Bar, Admiral Benbow, Chapel Street, Penzance from 8.30pm. No website, but click here to contact organiser, George Chippendale. Dreamers Folk : A great weekly club at the Sportsman's Arms, Four Lanes, Redruth. Be warned.... this audience can sing! Sunday, 7.30pm - 10.30pm. Stithian's Song Session: A well attended and thoroughly enjoyable monthly Folk Night, with singers and musicians travelling from all over the South West. Third Saturday of each month, September - May. Pensans Morris: Undoubtedly the most south-westerley placed Border Morris side in the Country! Cornwall Folk Festival: The 42nd Cornwall Folk Festival takes place over August bank holiday from Friday 22nd to Monday 25th August with lots of live artists, plus workshops and dance sets. The festival takes place at various venues in Wadebridge and offers street entertainment and friendly atmosphere, real ales in the local bars and a variety of folk styles as well as an array of local bands and Cornish music. 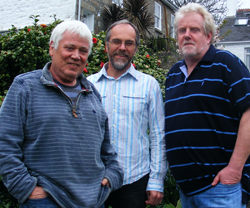 Star Inn, St. Just: Every Monday: The Diddly Dees - from 8.30pm Celtic Folk music. If you have an instrument, and can play, come and join in!